It just occurred to me that I haven’t actually posted on here to let you know that I’ve finished a CAN interface for ODrive, which is ready for testing. I’ve copied the documentation here for convenience. Let me know if you have any questions! ODrive assumes the CAN PHY is a standard differential twisted pair in a linear bus configuration with 120 ohm termination resistance at each end. ODrive uses 3.3v as the high output, but conforms to the CAN PHY requirement of achieving a differential voltage > 1.5V to represent a “0”. As such, it is compatible with standard 5V bus architectures. We’ve implemented a very basic CAN protocol that we call “CAN Simple” to get users going with ODrive. This protocol is sufficiently abstracted that it is straightforward to add other protocols such as CANOpen, J1939, or Fibre over ISO-TP in the future. Unfortunately, implementing those protocols is a lot of work, and we wanted to give users a way to control ODrive’s basic functions via CAN sooner rather than later. Be careful that you don’t assign too many nodeIDs per PDO group. Four CAN Simple nodes (32*4) is all of the available address space of a single PDO. If the bus is strictly ODrive CAN Simple nodes, a simple sequential Node ID assignment will work fine. * Note: These messages are call & response. The Master node sends a message with the RTR bit set, and the axis responds with the same ID and specified payload. ** Note: These CANOpen messages are reserved to avoid bus collisions with CANOpen devices. They are not used by CAN Simple. *** Note: These messages can be sent to either address on a given ODrive board. Configuration of the CAN parameters should be done via USB before putting the device on the bus. To set the desired baud rate, use <odrv>.can.set_baud_rate(<value>). The baud rate can be done without rebooting the device. If you’d like to keep the baud rate, simply call <odrv>.save_configuration() before rebooting. Each axis looks like a separate node on the bus. Thus, they’ve inherited a new configuration property: can_node_id. This ID can be from 0 to 63 (0x3F) inclusive. It’s so great! I’ve just found the UART usually doesn’t work for my odrive3.4. I wonder if the CAN Interface is suitable for odrive3.4? Hello! I am going to test the CAN protocol and I’ve flashed the firmware into my version3.4 Odrive.Everything is going well on my Odrive. But I’m not very familiar with CAN and don’t know how to write codes to control Odrive. Can you give some easy examples for stm32? For instance, some codes about how to control speed? You’ll need another device that speaks CAN, like your STM32, and it will need the CAN Transceiver hardware. If you don’t have that, consider getting an Arduino or Teensy with appropriate CAN shield. As you can see, I can use CAN protocol to transmit messages now and I am sure everything is OK on my two stm32 boards(The two blue boards in the picture).I can use board A to send message and board B to receive message. On the Odrive side, I set the node_ID same as your example. 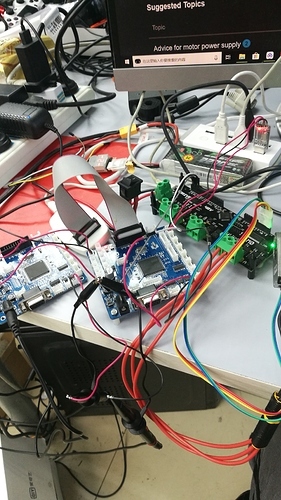 I use velocity control mode and motor can spin according to odrivetool. 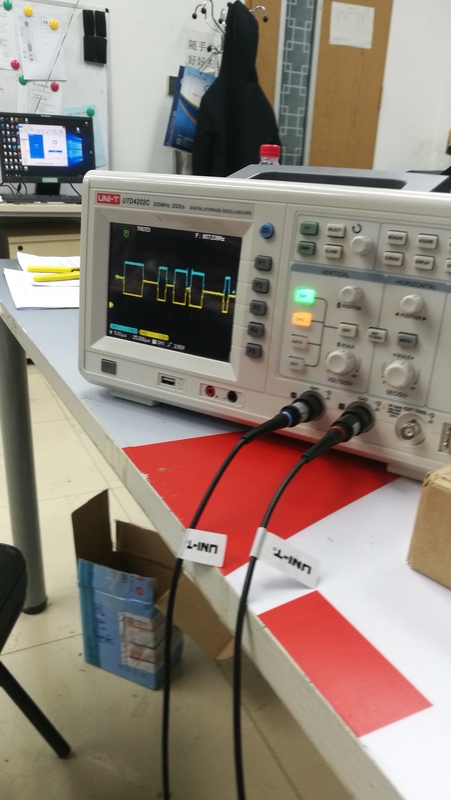 I am going to send vel_setpoint by CAN protocol to control the motor speed. Here is my CAN frame. 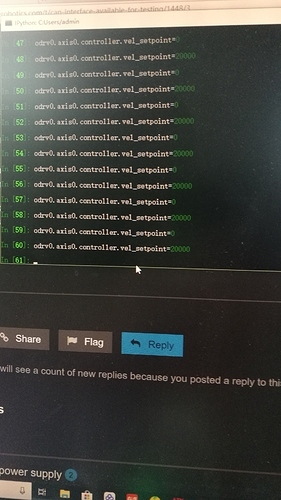 I am using odrv0.axis0, and the node_ID is 3(binary 011), the CMD_ID to set velocity setpoint is 0x013(binary 10011), so the StdId should be 0111 0011(the upper bits adds the lower bits), which is 0x73 in hex. But I don’t understand the signals so I give the signal the largest number. Can you make a more detailed tutorial? Hope you can understand my English. I made a mistake in the list of commands, please check again. I just cloned the repository and compiled the code, but it does not look like the examples you provide here. 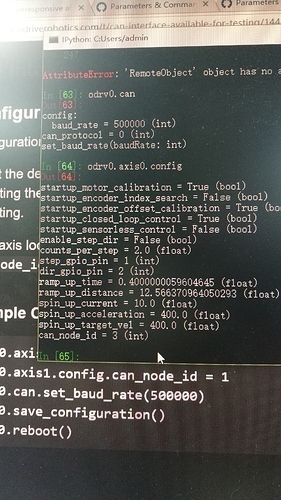 and in odrv0.axis0.config, there are no CAN-settings. Is there something I’ve missed when compiling the code? 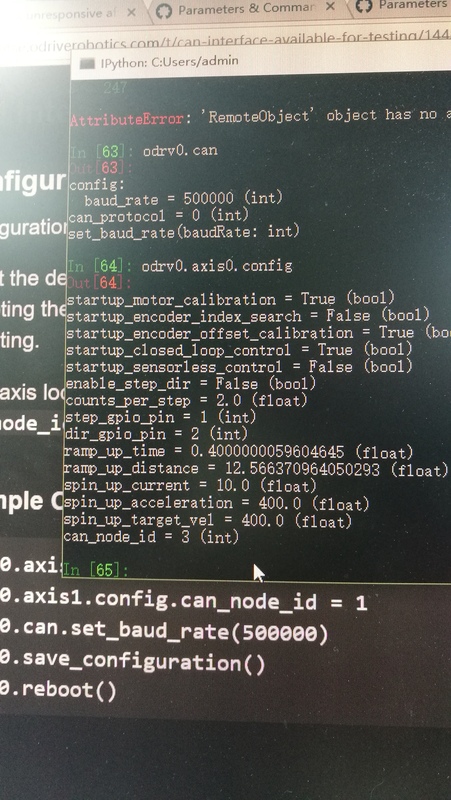 I can control an odrive under position,current and velocity mode through can.It feels convenient to control my odrives through can.But how can i read the current feedback? hello! Friends.Could you tell me how to control an odrive under position,current and velocity mode through can? Just added message 0x014, “Get IQ” which spits out the Iq Setpoint and Iq Measured for the requested axis. Hi, great feature! But I have a problem with it on ODrive hardware 3.5/24V. It seems ok on 3.4. Sometimes I get a few messages in CAN when reflash odrive, probably on start after reflash. But then silence. By the way I have some codes (my custom firmware) that uses CAN on Odrive and it seems working even on 3.5, so I believe hardware is not damaged. My setup is 500 Kbps, that I set in source code as default. I connected USB2CAN adapter and another CAN device on the same line, so I can see messages form another device but not odrive. Tried both with single ODrive and yet another device. When ODrive is only one device and I send messages from host, my CAN adapter became blinking, which means transmit/recieve error. Do you have any idea what can I do? I’m not sure why it would work on ODrive 3.4 but not on 3.5. Do you have termination resistance? I don’t think @madcowswe made any changes to 3.5 that would cause CAN to be misconfigured. I see, Yes I have termination resistor. If you’re comfortable using a debugger, you could put a debugging point in the CAN handler function to see if it is triggering? Unfortunately I don’t currently have any way to test. Hey @greenfield932, I just discovered there was a bug in the software where it was not validating the Axis IDs. Please pull the newest version of the branch and try again! 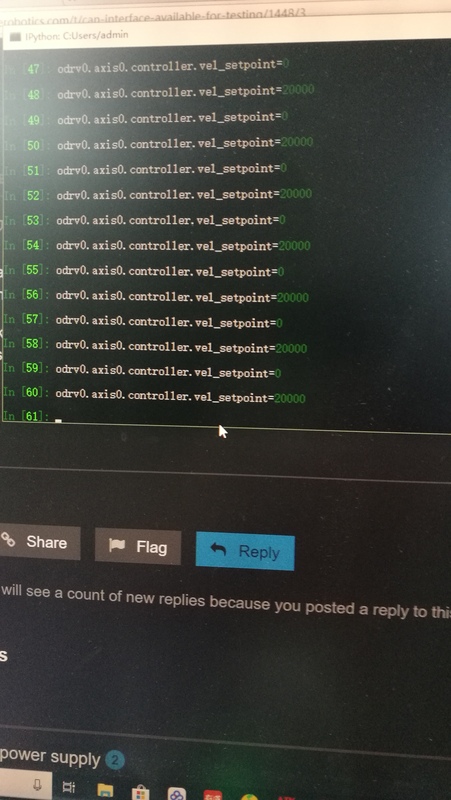 This function works well under velocity control mode and position control mode.Under current control mode,when I send a positive number,it still works,but when i send a number smaller than -10(included),it goes wild and does not work as i expected.I have no idea how to fix it. I checked the real current setpoint.When i send -10(10mA),Odrive received 25A.I 'm confused.